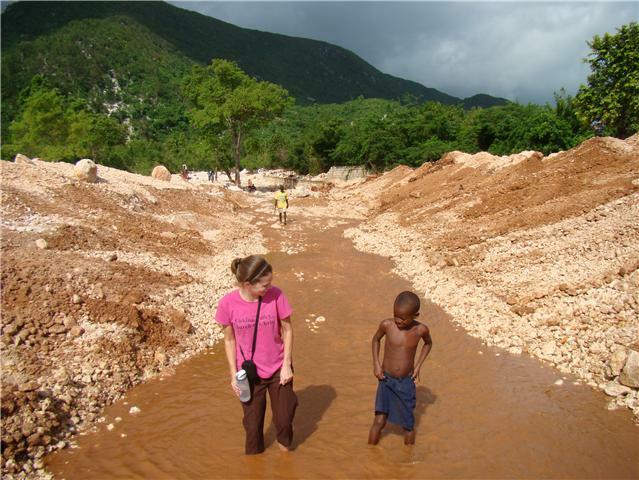 Ginny in Haiti: Exhausted but worth it! So no blog in a while. That would be b/c I have been out of the office working. And working. And working, And then took 4 days off to go home to Jacmel. Still tired but want to show you some pics. Angel Missions working with the US military while it was here for 10 days (Well almost 10-a potential hurricane that never came, forced the ship to go way out into the ocean to miss it should it have hit Port au Prince). I think every illness/accident/medical mishap in the country of Haiti came through the gates to be seen. My fellow medical professionals know how exciting this can be! Stuff I have only seen in text books and other stuff I never heard of came to be evaluated by the military. They did 109 surgeries on the boat and consulted anywhere from 600-900 people a day on the port. 600-900! The military was so efficient everything ran smoothly. I figured being the military and all it would be well organized. What I didn't expect was how friendly and caring the militray medical staff would be. Haiti was their 9th and final country in a row! They still had smiles as they worked long, hard days. I helped Angel missions coordinate translators (120 total!) and then start working up cases the USS Comfort could not handle to send to the states for medical visas. We have a whole new caseload of patients we are helping now and I will post their stories and needs on the blog so you can meet them, pray for them and consider helping them get a medical visa for life-saving surgery. This is the bittersweet part of my job. The patients the ship couldn't help were sent to me for evaluation to see if they are a canidate for medical visa. As I talked to some of them I knew they will most likely die before a medical visa gets set up for them. Though there were others who I think have a great chance of getting a medical visa. Here are some pictures from the Comfort. Note: I am in no way exploiting the patient's photo's. Please know I personallt asked each person or parent's permission before taking the picture. I am posting them so you can being praying for them.